It won’t change your baby’s diaper, but it will help to answer some of those Big Questions that new parents will have with their new bundles of joy! 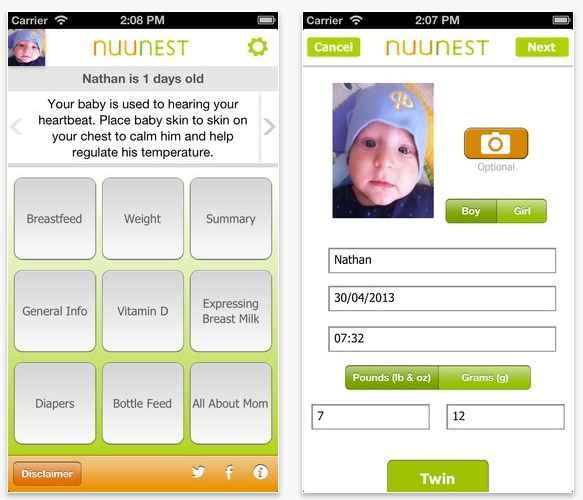 NuuNest, created by registered nurses Cindy Leclerc and Jana Stockham, is an innovative iphone app that easily tracks baby’s data. It includes health tips based on baby’s age and what to expect for feedings, diapers and weight. NuuNest also lets parents know if data is entered for feeds, diapers or weight are areas of concern. In summer of 2012 Saskatoon nurses, Cindy and Jana, contacted us with an app idea. They had been referred to us by the Women Entrepreneurs of Saskatchewan, and had come up with a business idea that involved creating an app that would track newborn’s feedings, diaper changes, weight, etc. Once we met Cindy and Jana and heard their ideas and their passion for providing a quality product to new parents across the world we were hooked and knew we wanted to work on the project with them. As with many of our clients, Cindy and Jana were very passionate and knew their area of expertise inside and out. What CollegeMobile brought to the table was the ability to design a world-class app around their vision. Once or twice a week we would hold design meetings that would bring Cindy and Jana’s vision to life. In these meetings our Interaction Designer would go through the wireframe designs screen by screen to ensure the flow made sense and would work seamlessly for the end users. Having Interaction Designers on our CollegeMobile team gives a special advantage to our clients as they get to work closely with the designer to ensure their vision is carried out exactly how they wished. Our Interaction Designers are also very educated in how apps should function and what will provide the end user with the best experience. Once the wireframe designs were approved by Cindy and Jana, they were sent to our developers to make the app come to life. Cindy and Jana were given builds to test as we made progress on the development. They also gathered dozen of parents and healthcare professionals to test the app and provide feedback before it was pushed to the Apple App Store. While we were working on the development, our app wireframe designs had been sent to a Hustle and Bustle, a Toronto design company, to put the extra sparkle on the app and make it look great. As I mentioned in our Lemonade Day and the App blog post, we often work with many teams who each bring a special skill to the table to complete the project. Once the app was officially launched, stories and press releases began popping up all over the Canadian and American media, thanks to a marketing team they hired. Once the app went live it received widespread exposure and quickly moved to the “#1 Paid Medical App on the Apple App Store” position! We were all very happy and proud that NuuNest was being so well received! Working with Cindy and Jana and developing the NuuNest app is a great example of how this collaborative process can work for other clients. Cindy and Jana had a very “hands on” approach that made the end product strong and filled with personal and professional touches that translate to a great experience for the user. To download NuuNest, visit The Apple App Store. If you have an amazing idea you would like to turn into an app, contact me at jess.bonish@collegemobile.com or at 1-800-298-7081.